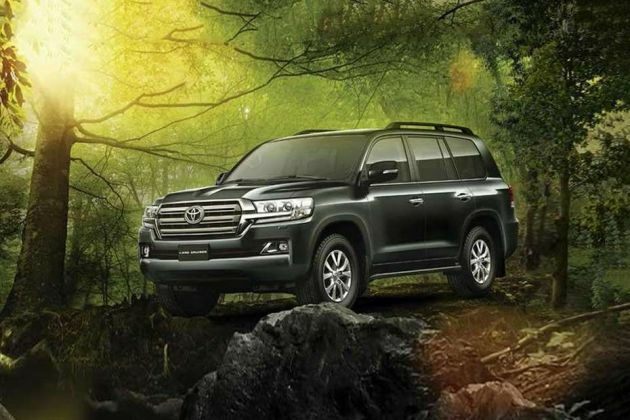 Toyota Land Cruiser 200 VX too gets a facelift this festive season and the new changes it has received, are limited only to its exteriors and interiors. This SUV has its front facade updated with a restyled radiator grille and LED headlamps, while a new set of alloy wheels are fitted on its sides. What's modified in its rear end are the tail lamps, which come along with turn indicators. Apart from the already existing body paint options, it is offered in two new colors which are Copper Brown and Dark Blue. Even its interiors come with Brown as well as Flaxen color options to select from. Other modifications inside the cabin include a new heated steering wheel, sophisticated multi-terrain monitor cameras, and LED illuminated entry system. It continues with the same 4.5-litre diesel motor that displaces 4461cc. This is paired with a 6-speed automatic transmission gear box that further boosts overall performance. Its front fascia now includes a new chrome treated radiator grille that includes the prominent insignia at its center. Surrounding this is a large headlight cluster that is equipped with projector LED headlamps. The well sculpted bumper is integrated with an airdam and a couple of fog lamps. Its side profile is updated with a new set of 18 inch alloy wheels that have a ten spoke design. These rims have tubeless radial tyres of size 285/60 R18 that give a firm grip on roads. Also, there are electrically adjustable outside rear view mirrors, which are heated and equipped with side turn indicators. In the rear, it has LED tail lamps and a stylish back door that is garnished with chrome. A high mount stop lamp is fitted to its sporty spoiler, while the bumper comes with a pair of fog lamps. Its luxurious internal section is packed with several advanced elements. This vehicle can carry seven people with great ease. The seats offer enhanced comfort and these come covered with premium leather upholstery. There is heating and adjustable functions for its front seats, while the armrest in second row includes bottle holder as well as storage space. The LED illuminated entry system is a newly added aspect in this facelifted version. There are two sunvisors available at front with illuminated vanity mirrors, while a sub-visor is also provided. Power outlets in all three rows adds to the convenience of its passengers. The overhead console has LED map lights and sunglass holder, whereas the multi information display offers vehicle's updates. Besides these, it has cabin lights, leather and satin silver finished gear shift knob, four spoke steering wheel with wood ornamentation, glove box compartment and a few other elements. A powerful 4.5-litre diesel engine is fitted under its bonnet, which comes with a displacement capacity of 4461cc. It has eight cylinders that are integrated with 32 valves. This has a common rail direct injection system and comes paired with a six speed automatic transmission gear box. It generates a peak power of 261.49bhp at 3400rpm and yields torque of 650Nm between 1600 and 2600rpm. This vehicle can achieve a top speed of around 175 to 185 Kmph and accelerates from 0 to 100 Kmph in nearly 12 seconds. In terms of mileage, it can return a maximum of 11 Kmpl on the highways and about 8-Kmpl within the city. The car maker has equipped it with a proficient suspension system that comprises of a double wishbone on front axle and a four link with coil spring on the rear one. Meanwhile, both its front as well as rear wheels are fitted with a robust set of ventilated disc brakes that is further accompanied by ABS with EBD. Besides these, it is offered with a responsive, power assisted steering column that aids in easy handling. Availability of numerous interesting features makes the journey enjoyable to its occupants. It is bestowed with an automatic air conditioner that has four zone independent control. There is an advanced audio unit which includes a touchscreen display, and AM/FM radio tuner. It supports USB port, auxiliary input options and has 14 high quality loud speakers. The steering wheel with tilt and telescopic adjustment functions also, comes mounted with audio, telephone and MID controls. The power operated windows have one touch up and down along with jam protection functions. There is also park assist system with back camera and sensors as well. Another highlight is the moonroof that brings in cool air and warm sunlight. Aside from these, the list also includes optitron meter, multi-terrain monitor, cruise control, front rain sensing wipers, cruise control, console box with cooling function, and auto dimming inside rear view mirror for enhanced convenience. This trim is loaded with security attributes like ELR seat belts with pretensioners and force limiters, tyre pressure monitoring system, engine immobilizer, and vehicle stability control. In addition to these, it also has dual front, knee, curtain as well as side airbags, downhill assist control, ABS with EBD and brake assist, active front seat headrests and a few others. 1. Eye catching external design. 2. Engine performance is quite exceptional. 1. Fuel economy is not satisfying. 2. High price tag and maintenance costs. టయోటా ల్యాండ్ క్రూయిజర్ 9 వేర్వేరు రంగులలో అందుబాటులో ఉంది - White Pearl, Copper Brown Mica, Dark red mica Metallic, Super white, Attitude Black, Grey Metallic, Blue Mica, Silver Metallic, Beige mica Metallic.